If you're planning to grill for the 4th of July, you're in good company. The Hearth, Patio & Barbecue Association says that Independence Day is the hottest (most popular) day of the year for outdoor cooking with 69% of all grill owners firing up for the 4th. This year is expected to be an even bigger grill year with food prices high. More folks are cooking at home and staycations (staying at or near home over the vactation period) is a new trend being noted. Staying at home doesn't have to be dull, and breaking out the grill or buying one is a good way to have fun. Grill sales are up this year according to Lowe's. They've seen a double digit increase. My aunt works down at Lowe's, and she says she's definately been busy. If you're trying to decide on what type of grill to buy, take a look at Gas or Charcoal. There are pros and cons to each. 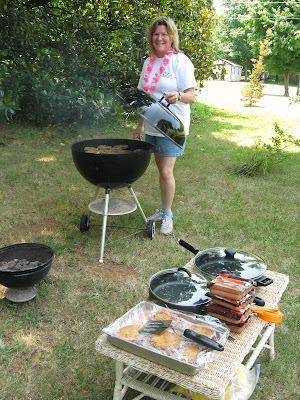 For recipes, ideas, and tips, check out Yes You Can Grill. Graduation Assembly Line - Why Bother?